Gliderol sectional garage doors are 40mm thick insulated, manufactured from steel with no kick-out and are one of the most insulated garage doors on the market. Available in a large range of colours. 10 years manufacturers guarantee. Made in Germany. 40mm thick rigid CFC-free foam core. Soft rubber gaskets between the panels and on all four edges ensure draught-proofing, as well as insulation. The fitted door has a u-value of 1 w per square metre. Ribbed and Georgian designs available. Can be a manual door or reliably and cheaply automated with a remote control kit. Available ex-stock in White. Standard and special RAL colours available, on request. 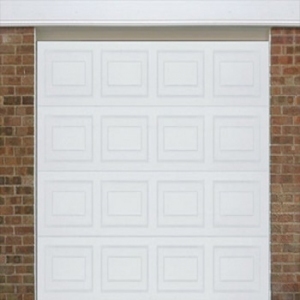 All Gliderol sectional garage doors are made-to-measure.